Huge tree trunks or sections of tree trunks can make a cute bench when set on casters. Furniture like this can also be used in the dining area or extra seating both indoors and outdoors when you have company over. What’s not to love? Slice off a section of a tree trunk and you’ve got yourself a bench that no one else will ever have. You can also carve out a tree trunk so that it has a seat and sides but still feel and look organic. Don’t forget to seal your masterpiece with a wood-friendly polyurethane or polish! Speaking of treating wood, you can certainly transform driftwood into a bench or a decorative piece in your home. You may need to chop off pieces that are too rotten, though. This is for you if you want a no-fuss and straight-up use of raw wood in your home. 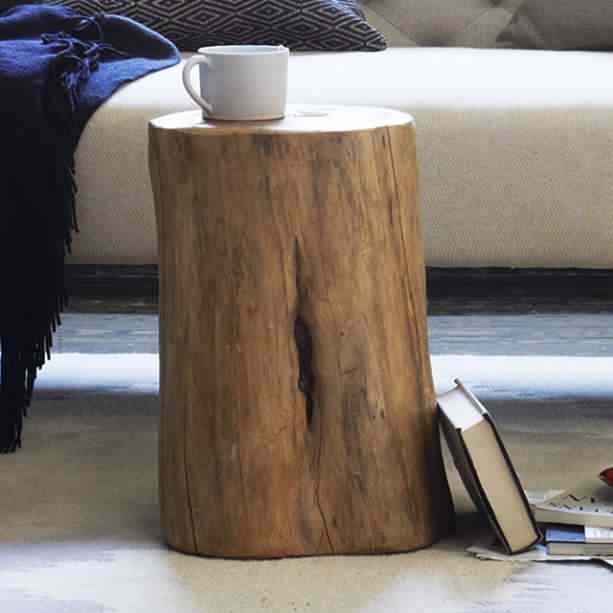 Besides, tree stumps are often already the perfect size for a side table so all you got to do is clean it up, level the top, and apply a sealant! You can also group several tree stump side tables for more visual impact or attach casters at the bottom to make them mobile. Think of this as an arty way to use up firewood (sort of!). If you have a special tree but it had to be taken down, chopping the wood into logs and combing them to form a solid piece is a great way to keep it with you. The bonus part is that this furniture piece doubles as an art installation of sorts. If you want a one-of-a-kind dining table or furniture piece, then mount a polished sliced-off section of a tree trunk on top of some table legs. The beauty is simply breathtaking! It can’t get more rustic than using small tree trunks to create a bedframe! Just be sure to not combine this with too much other wooden details in the room or it can get very overwhelming. There are so many home furnishings that you can create from worn wood and metal but the best might be a coffee table in an otherwise stark room. Because worn wood may not be easy to come by, what little you can get is more likely to be the right size for a coffee table project. Love nature and woodlands? You’ll love the multitude of green space in Oakville! With neighbourhoods built close to nature, you’ll surely be in your element here! Take a look at the available Oakville homes and you might just get lucky to chance upon your dream home. Contact us for a viewing!